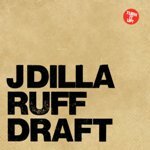 Ruff Draft is the first of what will undoubtedly be several reissues, retrospectives and compendiums of posthumous material by the illustrious late producer James “J Dilla” Yancey. He got his first break working on the Pharcyde’s 1995 album Labcabincalifornia, and issued numerous instrumental LPs during his lifetime in addition to the major and underground artists he produced. Such a massive legacy inevitably leads to a catalog of strengths and weaknesses. Unlike the ridiculous hypesters who canonize the Notorious B.I.G., it is impossible to argue that J Dilla was immaculate and perfect. Taken in this context, Ruff Draft has its share of pleasures. The EP quietly dropped on J Dilla’s Mummy Records, with worldwide distribution by Groove Attack, and arrived at a time when many heads considered him past his prime. In a press release, Stones Throw Records asserts, “In retrospect, Ruff Draft proved to mark a turning point in Dilla’s career.” This is true: shortly afterwards, J Dilla would team with Madlib for the Jaylib album, a project unfortunately marred by rampant Internet bootlegging. (In response, the two musical giants recorded new tracks that many fans felt didn’t compare to the leaked ones.) Nevertheless, J Dilla would continue to reinvent his sound, and triumphantly produced the Donuts and The Shining discs shortly before his death. Not everything hits on Ruff Draft. Some of the songs, like “Interlude,” seem superfluous. But even the weaker cuts like “Crushin'” bear J Dilla’s signature production steez and knife-hard monsyllabic lyrics. The second CD, a collection of instrumentals, is strictly for Serato jocks. Ruff Draft, after all, isn’t as layered as Donuts or even Welcome 2 Detroit, but it bangs tough enough. This entry was posted in Reviews and tagged J Dilla. Bookmark the permalink.